The new series discovered in Intel’s official files currently lack Core i7-9000 series, which are rumored to be 8-core and up to 16-thread SKUs. 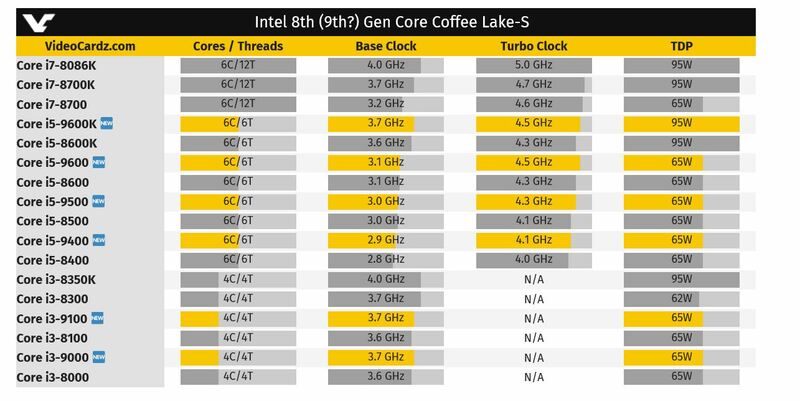 The new processors added to Intel’s Coffee Lake S lineup feature Core i5 and Core i3 9000 series, which are six-core and quad-core in configuration. We are observing a frequency boost up to 200 MHz in Max Turbo state while preserving 8th Gen successor’s TDP. The new series were not added to Intel’s Ark, which is considered a confirmation of a product launch. The new SKUs can only be found in Microcode Update and June 2018 8th Gen Core Family update. What this means is that the products are not yet *released*. They are however present in official documents, thus they are confirmed. The full 9000 series lineup is likely to be officially introduced with 8-core SKUs, which are not present in the same documents yet. Interestingly, the 9th Gen Core series are listed as 8th Gen Core parts, which might be found confusing. Intel - decimating the overclocking headroom every year since 2015. What else is new? so no hyperthreading added to the i5's for at least another year. Quite a few chips are missing from that list, though. Listing the base clock of Intel CPUs is pointless, as the CPU never runs at that speed unless Turbo is manually disabled from the bios. All-core turbo clock is what matters and that info is missing. Intel doesn't list that anymore, though. Most of the chips are listed in the latest 8th gen update at Intel. All hail Wikichip, clock info will find a way! Wikichip was largely wrong about the 9000 series, though. I have no problems with Intel getting better at selling us chips which are closer to the theoretical maximum clocks their silicon can support. I'm still wondering why we need the 8650K/9600K and other such pairs which seem to have identical specs. I was thinking it's for earlier chipset compatibility? Yes, Wikichip had the 9000 chips all bumped up a level before this latest info came out. i5 was 6C/12T. They have now changed the page. They also had the 9700K as 8C/16T, now it's just blank. Yes, Wikichip had the 9000 chips all bumped up a level before this latest info came out. They have now changed the page. The 9000 series isn't launched yet. Why would you evaluate their reliability based on that? Because I have been touting their site and using their list of "Coffee Lake R" chips as a source of preliminary info. Unfortunately, it turned out that their list was very optimistic, even though it matched most of the speculation that was going around. I would assume they use publicly available info - including rumors, and only become truly reliable after products end up in consumer hands. Wikichip very clearly labels the stuff as preliminary info. What I find even more funny, is that the 9xxxx 4 core parts, are rebranded 8xxx parts, which themselves were actually rebranded 7xxx parts. Progress? Logically the 9700K would be 3.7/4.9 but that would put it behind the 8086K. I hope they are not all just 200mhz bumps in the single core turbo, with the only new chip being the 8 core. But I'm afraid that's what they are, with equivalent 8000 versions for older chipsets thrown in. I notice a B-0 and a U-0 i3-8100 stepping. Defeats the premium they command for the K models though. Less headroom for overclocking, progress yay! Less headroom for overclocking is actually something positive, since Intel is leaving less potential un-used on the table. Suddenly you don't need to buy the top trim to get all of the features, and you're complaining? I get it though. Intel is better utilizing their silicon, and it's causing our hobby to disappear. I'm not complaining, it's just showing that in the last couple years Intel had nothing to offer aside chipping away at the overclocking headroom that was already there.